In its first few years as a meeting place, Reason Center has served as a venue for a wide variety of gatherings. As a facility available to rent by members of the public, RC has accommodated multiple dramatic performances, wine and cheese celebrations, memorial and birthday commemorations, craft workshops, committee meetings, and panel and book discussions. Even a wedding! RC provides an excellent place for planning/staging events held elsewhere (such as a march or tabling occasion) and some organizations, such as California Climate Lobby, utilize Reason Center as their regular meeting place. Two recent gatherings deserve special attention because they mesh so closely with the educational mission of the Reason Center itself. Both programs had a distinct purpose: not just to inform attendees, but, more importantly, to sharpen their critical thinking. The two presentations were brought to Reason Center by two of its partner organizations: the nonprofit Atheists and Other Freethinkers (AOF), and the Sacramento Area Skeptics Meetup (SAS), both of which have educational missions of their own. Counseling Quackery was the subject of AOF’s end-of-the-month speaker series on July 29. Sheldon W. Helms, Professor of Experimental Psychology at Ohlone College in Fremont, offered a dynamic presentation which revealed how several quack therapies, even some from mainstream psychology, are less than sound in their approach to mental health. Not only are some so-called therapies a waste of time and/or money—some are downright dangerous. Helms gave the audience stunning data about the inefficacy of 12-step programs and touched on the roles of money, therapist credentials, and the all-too-gullible public. He also shared tips on how to spot fakers and snake-oil peddlers. Furthermore, he offered practical advice for those interested in accessing genuine evidence-based therapy most likely to improve their lives, such as cognitive behavioral therapy. 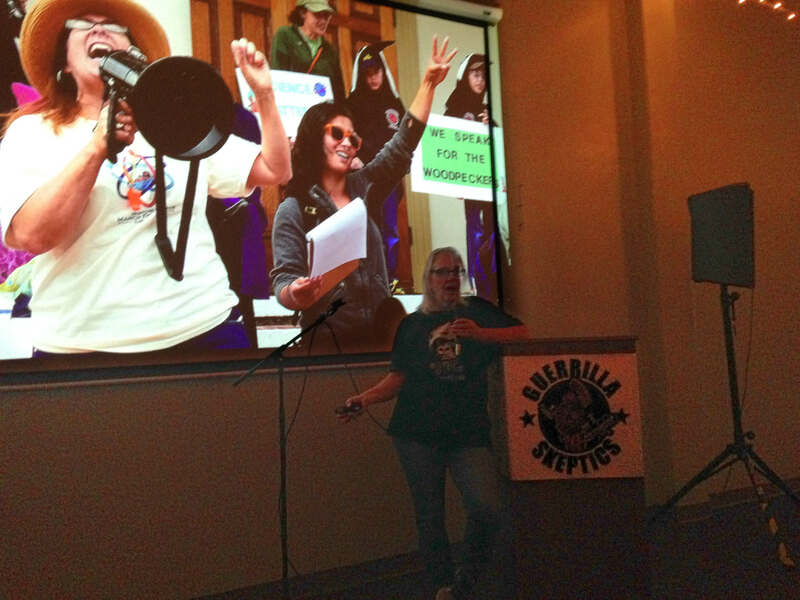 Susan Gerbic, a noted skeptic/activist from Salinas, focused her August 2nd presentation for the SAS group on the Guerilla Skepticism on Wikipedia (GSoW) project. She focused much of her presentation on two examples of turning a skimpy Wikipedia stub into a full-blown presentation. One was about the amateur astronomer Thomas Bopp, who co-discovered the Hale-Bopp comet. The other was about Stanley Plotkin, who played a pivotal role in the discovery of a vaccine against the rubella virus and was highly deserving of appropriate acknowledgment for his many contributions. Besides augmenting information about scientists, the GSoW team also focuses its efforts on exposing clairvoyant mediums who prey on others. Gerbic’s example of note was the “psychic” Tyler Perry. One highlight of her presentation was enlightening the audience on the value of Wikipedia’s page-view data, showing how real world actions can be deduced from the statistics. How wonderful to have had both of these energetic speakers here in Sacramento at Reason Center. More to come! Both were a superb presentation. And it was especially thrilling to see a Sacramento Area Skeptics event at Reason Center. I already look forward to the next one!